Part 3: Configure Qemu/JunOS Preferences. Start by opening GNS3 Preferences, Qemu settings [General Settings] tab. Click the Test Settings button to ensure that your OS has paths to qemuwrapper, qemu and qemu-img. If not, check your GNS3 install directory and make sure these files are present. If necessary, specify the exact path to each by clicking on the ellipsis (…) next to the field where these paths are defined and find the appropriate directories. Step 1: Gather the required files. 2. Your copy of the JunOS operating system. It will be a file with a name something like jinstall-9.6R1.13-domestic-signed.tgz. In this example I will use jinstall-9.6R1.13-domestic-signed.tgz as the example Junos image file. I suggest copying your base image freebsd-4.11.img to a name that will reflect the version of JunOS you plan to install. I will use the name olive-9.6R1.13.img. The copy will be the base file for the future operations. Task 1: Install JunOS files. 1. When the image boots, login with the username of root –password root. The operating system has halted. Please press any key to reboot. Task 2: Boot your image with console access. 5. Once your router has shutdown, exit Qemu in the usual way (Press <Ctrl>+<Alt>+2, then type quit). Your JunOS image JunOS9.6R1.13 is now ready for use in GNS3. In GNS3, open GNS3 Preferences, Qemu settings at the [JunOS] tab. Give your image a name in the Identifier name: field, such as JunOS9.6R1.13. In the Binary image: field, click on the ellipsis (…) and locate the olive-9.6R1.13.img file in your Junos directory. IMPORTANT: Make sure you click Save before you click OK, and you can see your saved image in the list of JunOS Images at the bottom of the dialogue. Now when you add routers to your topology, the Junos router symbol will be available. Last edited by rednectar on Thu Mar 20, 2014 5:02 am, edited 1 time in total. Awesome! may I use your howto to create a documentation page for JunOS emulation on http://gns3.net/documentation/ ? Of course! I hope to put it into a blog post one day. It is actually a sort of excerpt from another larger piece I'm working on. But then I'm not able to open a telnet session to anything from the Windows command prompt, no matter what I try. I always get "Could not open connection to the host, on port 3001: Connect failed". I'm sure I'm just doing something stupid or missing something obvious. Any guidance would be appreciated. Thanks again for your great post! command from an administrator window. Have to admit, most of the development was done on Linux. I'm running OSX 10.8.4 and have just installed GNS3 0.8.4. Qemu appears to be working at least somewhat as I was able to run an ASA image from it successfully. I'm now trying to get Juniper to work and have made it through these instructions to Part 2, Step 3. 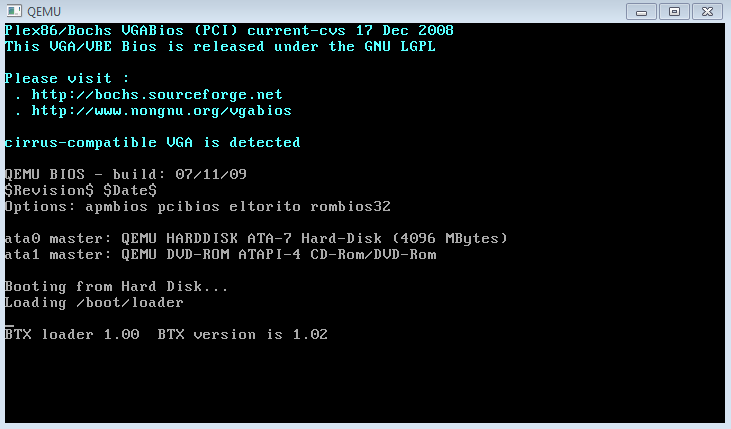 From Qemu, I log in, mount the cdrom, and execute the pkg_add command (pkg_add -f /cdrom/jinstall-12.1R5.5-domestic-olive.tgz). After the checksum is verified, it returns the following output. pkg_add: tar extract of /var/tmp/instmp.IZdQLU/jinstall_pkg failed! pkg_add: unable to extract table of contents file from '/var/tmp/instmp.IZdQLU/jinstall_pkg' - not a package? The olive-12.1R5.5.img file increases in size from 363MB to 1.2GB so it looks like it's at least looking at the right path. I've tried this twice now with the same result. Any ideas on how to get around this? Do you see any errors in that part? Looks like it matches what you're expecting. I'll try your suggestion to add memory to the qemu process and give it another go... There's also a 64bit version of the image I could try out if the memory change doesn't work. I tried 6 different Juniper versions from 10.4 to 12.1 with no success utilizing the junos-auto-fix-checkpic script. I even tried it using both OSX and Windows. I think the primary issue is a structural change in the file system for the newer images. I'll try and post a write up for what worked for me as soon as I have time to validate the process and get it documented.